Up your game in the kitchen with Yuppiechef's online cooking courses. Learn at your own pace, in the comfort of your own home. Why not get the kids involved too? Fascinated by French Cuisine? 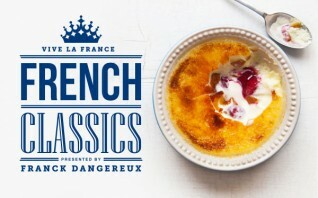 Join accomplished chef and restauranteur Franck Dangereux as he unravels the mystique around classic French-style soups, sauces, poultry, potato dishes, steaks and desserts. Learn the history and secrets behind Franck’s recipes, and gain the confidence and skills needed to artfully create timeless classics Steak Au Poivre, Soupe Au Pistou and the fabled Crème Brulée. Join award-winning pastry chef Kirsten Tibballs at the world-leading Savour Chocolate & Patisserie School – the first school of its kind in the Asia Pacific – online cooking classes. Learn to cook like a professional pastry chef from the comfort of your very own kitchen. Our easy-to-follow online video tutorials and downloadable recipe books are available with great-value monthly or yearly subscriptions. Helps you develop the pharmacy and customer service skills needed to pursue one of over 70,700 new jobs expected in this field by 2022. The pharmacy technician career path offers a number of benefits, including: The Career Step Pharmacy Technician program was developed by a board-certified pharmacist and pharmacy technicians with years of experience to prepare students for the Pharmacy Technician Certification Board (PTCB) Exam. Walgreens and CVS Pharmacy have partnered with Career Step to provide externs for their locations nationwide, and managers have expressed appreciation for the high level of preparation Career Step’s students and graduates bring to the workplace. The learning objectives outlined below provide a map of the knowledge and skills you’ll gain as you complete each module. Gain the skills you need to work at the crossroads of the growing healthcare and technology industries. With this training you’ll graduate prepared to earn the CompTIA A+ certification as well as the CEHRS and CMAA credentials from the National Healthcareer Association. Career Step’s Health Information Technology program includes training on everything you’ll need to earn the A+, CEHRS, and CMAA credentials. Career Step’s expert-developed curriculum also includes training on ezEMRx software, a government-certified EHR software platform to ensure you have the hands-on experience you need. With Career Step’s affordable tuition, you get a quality online education with one-on-one support. The learning objectives outlined below provide a map of the knowledge and skills you’ll gain as you complete each module. Prepares you for the growing field of healthcare reimbursement—employment is expected to grow by 22%—by teaching you the skills needed to earn industry credentials and start a rewarding career as a medical coder. The medical coding and billing field offers a number of benefits, including: Nationwide shortage – There’s a great need for well-trained medical coders nationwide—in fact, there are estimated to be 30% more positions than professionals! This shortage will only increase with all of the coming industry changes. Healthcare security – The healthcare industry is one of the fastest growing in the country, and medical coding gives you a chance to enjoy that security from an office setting with many opportunities for promotions and advancement. Competitive salaries and benefits – Medical coding and billing professionals enjoy competitive salaries as well as the potential for traditional employment benefits. Windows 8, released by Microsoft Corporation in 2012, was the largest redesign of Windows since the introduction of Windows 95. This operating system has been met with mixed reviews. Windows 8 works very well with modern touchscreen devises. This course provides a basic overview of the operating system, geared toward giving the user comfort performing basic tasks such as navigating the system, customizing the start screen, and finding tools familiar to Windows users. The course also explores the Charms menu and provides an overview of basic tasks and how they are performed in Windows 8. This program applies the science of behavioral change, while redirecting and narrowing the focus of instructional design to those things that matter most in creating successful e-learning applications. You will not only find effective ways to design meaningful, memorable, and motivational experiences , but also a blending of successful behavioral change principles. Based on dozens of research studies, these principles will help you design learning events that go far beyond the transmission of information to achieve behavioral change and targeted performance levels. A simple guide to developing your first website. You likely know it as a blogging platform, but WordPress has evolved into a full content management system. It’s been embraced by developers and designers all over the world, and now powers nearly 20% of the internet. Building your website on WordPress can be simple and quick, or it can push the limits of your creativity through thousands of plugins, themes and widgets available for use with the system. Join Jesse Friedman on a journey to create your first WordPress site, and in just 28 days, you’ll learn WordPress— and how to build a business, blog or personal site with nearly no out of pocket expenses. Dr. Bill Haig breaks down his “credibility-based logo design”© process. A model he championed from the teachings of his legendary mentor, Saul Bass. In this course, Dr. Haig will break down this concept and teach you how to design logos that sell. He says it’s about credibility, and persuasive communication. In just two weeks, you’ll walk away with a greater understanding of how to plan a logo design project with your client, create effective logo design solutions, and be able to pitch yourself and your ideas. Most popular Ethical Hacking course is now available in an online format! Rest assured, we have made every effort to replicate the same training experience you would receive in our Instructor-Led Ethical Hacking course. Many online or CBT training offerings are simply a recording of a talking head. Intense School's Hacker Training Online includes a shipment of software that is loaded onto your computer, which allows you to complete over 30 hours of hands-on lab exercises! Мы отобрали лучшие курсы для менеджеров по продажам. Вы научитесь составлять коммерческие предложения, устанавливать правильную цену, выступать перед аудиторией с презентацией и вести переговоры один на один, делать профессиональные "продающие" слайды презентации, мотивировать сотрудников отдела продаж и эффективно планировать собственное время. Пройдите все курсы, сдайте экзамены, получите от Eduson диплом "Мини-MBA по продажам" и сделайте шаг к успешной карьере!